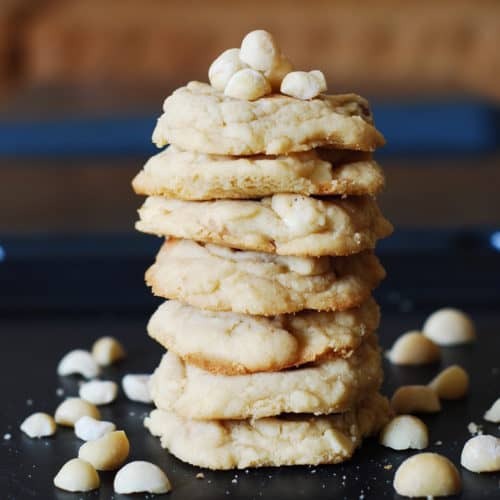 White Chocolate Chip Macadamia Nut Cookies – delicious easy-to-make cookies, stuffed with macadamia nuts and white chocolate. If I told you I had a sudden craving for a white chocolate macadamia nut cookie I’d be lying. But if I told you I had a huge bag of macadamia nuts purchased by my husband a couple of months ago and that last year I stored macadamia nuts for a whole year because I forgot about them and then they didn’t taste good, and that I did not want to waste another bag of expensive nuts and repeat last year’s mistake – then I would be telling the truth. 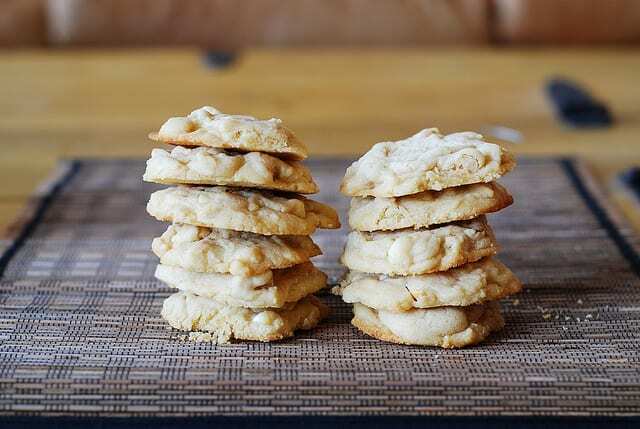 Regardless of what motivated me to bake lots and lots of these cookies, the second batch of these white chocolate chip macadamia nut cookies trumped the first one by such a large margin, I am eager to share this simple recipe. Let me tell you what I did differently between my first batch and the second batch. The only change I made was that before adding nuts to the cookie dough, I toasted the macadamia nuts and then immediately tossed them with salt. Sounds so simple, doesn’t it? It was not so apparent to me. You see, we like to purchase everything nuts in bulk, raw, unsalted, and that kind of macadamia nut, it turns out, does not work so well in a cookie. When I made a first batch of these white chocolate chip macadamia nut cookies, those big raw unsalted macadamia nuts tasted a bit too bland. However, after I toasted the nuts for just 5 minutes at 350 Farenheit, and then immediately rolled hot nuts in salt (to make sure released oils would make it easier for salt to adhere to nuts) – these kind of macadamia nuts, toasted and salted, added an amazing flavor to the white chocolate chip cookie. Macadamia nuts, as you know, are relatively large nuts, but I decided against chopping them into smaller chunks because 1) I didn’t want to do it manually, with a knife, because it would take too much time; 2) When I tried to do it with the food processor, within seconds half the nuts were finely ground, while the other half remained as big and whole as before. Macadamia nuts are way too rich in oil to be chopped in a food processor, unless, of course, you want to make a macadamia nut butter. So, I decided not to chop macadamia nuts and used whole ones or the ones that were already halved for these white chocolate chip cookies. 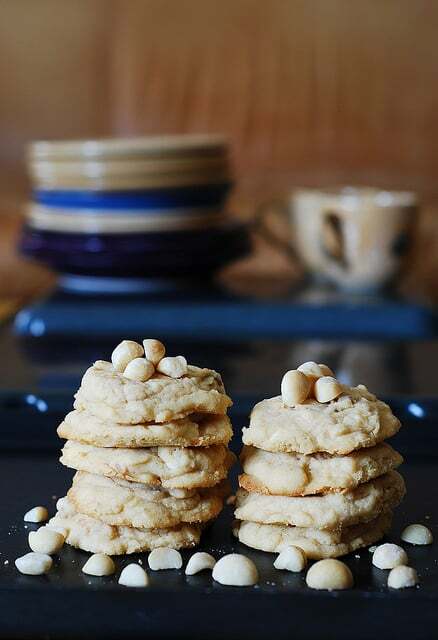 White Chocolate Chip Macadamia Nut Cookies - beautiful and delicious cookies with macadamia nuts. Preheat oven to 350 F. Spread macadamia nuts on a cookie sheet and toast them for about 5 minutes in the oven just until they turn golden. Remove nuts from the oven into a small bowl while they are still hot and toss with 1/4 teaspoon salt. Then spread them on a plate to cool. Tossing nuts while they are still hot with salt helps salt adhere to nuts. Make sure butter is not over-melted: it should sit out at room temperature for about an hour and should not be liquid. In a large bowl, using mixer, blend butter with brown sugar until creamy. Add vanilla and an egg and continue beating until creamy again. Add baking powder and flour and beat on low speed for a minute, than on average speed for a couple of minutes until all dry ingredients are well incorporated. 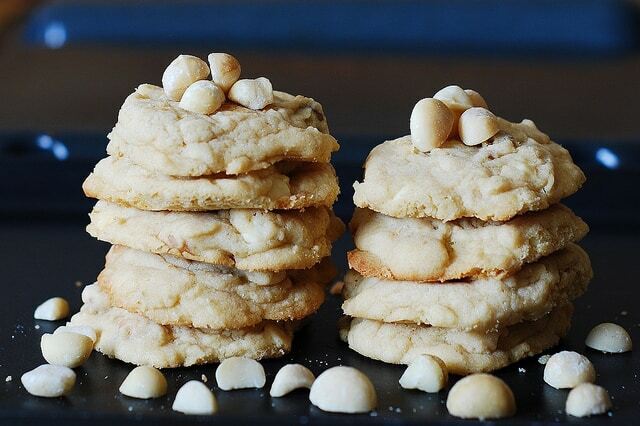 Using spatula, fold macadamia nuts and white chocolate chips into cookie dough. Place spoonfuls of cookie dough onto un-greased cookie sheet. Bake for about 15 minutes at 350 F. Mid-time through baking, I like to pull the cookie sheet out and flatten the cookies with the butter knife: because the dough is made with colder butter, the cookies don’t spread out as much, and flattening them out just a bit helps their appearance. Don’t flatten them out too much, though. Remove from oven and let cookies cool. now I’m in the cookie mood! sharing this one on FB! I love white chocolate macadamia cookies. 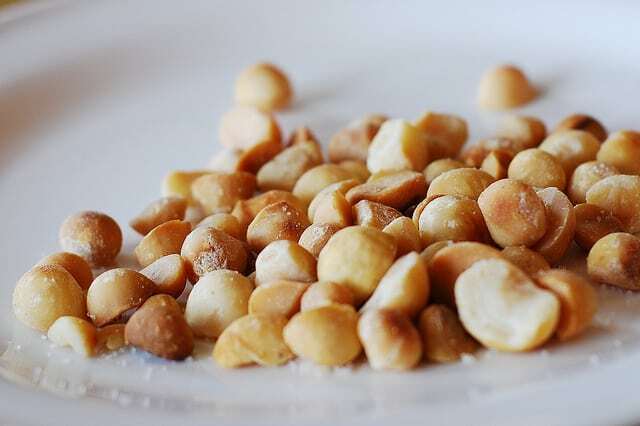 I’m a huge fan of macadamia nuts – I think they taste kind of like popcorn. I have also been on a hazelnut kick lately. Macadamia anything looks good, but these sound delicious! Having too much stuff to use is a nice problem, isn’t it? Although not fun when they go bad (I always store nuts in the freezer so that won’t happen). Great cookie! I don’t believe I’ve ever had macadamia nuts in a cookie before, and definitely not with white chocolate. Good stuff – thanks. Yum! 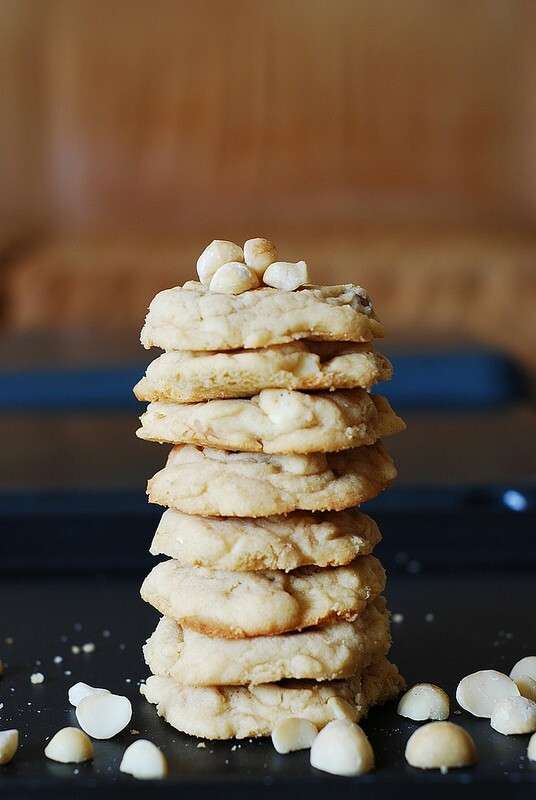 White chocolate macadamia cookies were always one of my favorites as a kid : ) Strange but true.